I was twelve years old playing with my brother in the bedroom we shared. My dad walked in on a Saturday afternoon. He told us God had called Him into ministry and we would be moving to Texas to plant a church. After he left the room, I whispered in my mind, “Thanks for sharing, but I’m not going anywhere.” My brother and I returned to our playing-not having any idea what serving in ministry actually meant. I knew I had no desire to leave the comfort of our home and my friends here in Iowa. Now, fast forward thirty-five plus years. Fired from a job that I enjoyed and thrived in having earned millions of dollars for the company. I had busted my tail in rehab to return to work after my stroke in 2010. Things were definitely in flux as I sat in my living room conversing with the oldest of my sisters about what had happened. I was not sure what was next for myself. I had been successful in sales in marketing for almost twenty years. In the immediate future of being fired, I enjoyed not having to wake up with the roosters to begin working at 6:30 in the morning. However, it was not long before I was longing to do something productive. In November of 2014, my baby sister sent me an email. In the email, she mentioned how much I always wanted to write. She also sent me some links to various blog sites and suggested that I consider creating one myself. Blog? Seriously? I scoffed at the notion. My perception of a blog was someone detailing their daily activities like an online journal. For example, today I went to the store, walked the dog and had lunch with a friend, etc. Despite my misguided perceptions, I clicked on the links and began to read the different blogs. I was pleasantly surprised! The writers of these blogs seemed to be helping people! They offered helpful tips, ideas, and even encouragement to their readers. I was stunned at the responses and comments that their readers were leaving. Thanking them for the help, or sharing similar experiences mentioned in the post. I wanted to create a blog to help and encourage people as well. God had given me a new purpose! It was exhilarating to have purpose waking up each morning. My firing was in the rear-view mirror. I needed to figure out this “blogging” thing. Thankfully, I came across a lady named Sue who had a blogging academy. Nevertheless, My blog needed a name. I was already in a praying state of mind-asking God for direction. Now, I was praying for Him to give me a name for my website. Initially, I wanted to incorporate the words “salt and light” for my blog. It was my heart’s desire to glorify God with my life and my writing. Googling salt and light, it was everywhere. I said, no thanks-I wanted something unique, so I continued to pray. It was the week between Christmas and New Years Day-kinda a sleepy week. My radio was on Christian radio. I was listening to a poignant message from Chuck Swindoll. Then it happened! God gave me the title for my blog site, PleasingtothePotter.com. It was such a wonderful epiphany. The name of my new website represented everything I wanted to do with my life going forward. The excitement of writing and publishing my first post was a huge victory. It had taken several weeks of trial and error-several errors just getting the website setup. I was so thrilled and hopeful to share what God had done in my life since the stroke. I published an article titled, New Creature in Christ. Even though I had accepted Christ as my Savior at the age of 5, I was not living for Him. The first post was published, and I waited and waited some more. Nothing. No response and no comments. It was months before that initial post received any feedback. My next post the following month was about the same, I doubled my comments from one to two. Something needed to change. It is because of the kindness of Crystal Storms of Heart encouragement, Lori Tullis over at Frog’s Lilypad, Deb Wolfe with Counting your Blessings and Lori Schumacher with Moments of Hope that I am continuing to write today. These Godly, Christian women were some of the very first to welcome me into their blogging communities and allow me to share what God had put on my heart. A massive thank you to these women and the women who participate in their weekly link-ups for welcoming me and encouraging me in my writing. Lori Tullis, your prayer partnership has meant the world to me. Just know I continue in prayer for you and family. A special heartfelt thanks to Marva from SunSparkleShine who has been there to help and support me during some of the severe health issues I have been battling the past few years. She offered to and had written beautiful blog posts on my site when I was unable to do so. Her review on my book on prayer she emailed me almost brought me to tears. Also, I want to say thank you to Melanie Redd. She was the first person to pin some of my images and invite me to share my posts in Christian/Bible groups on Pinterest. Her words of encouragement from the beginning meant the world to me. One thing that has stuck with me was that when on more than one occasion one of the ladies would leave in the comments, May God bless you in your ministry.” Ministry? There’s that word again almost forty years later when I’d heard it from my father. Words cannot express how much I appreciated the kind words of encouragement from all of these women. However, I was confused when they referred to my “ministry.” In my mind, there was no ministry, I just wanted to write. That word was still scary to me. I had never considered that God would use my writing as a ministry. However, for me, this has become a double blessing. I have the opportunity to share my testimony of faith doing something I love-writing about my Lord and Savior. One of my all-time favorite passages of scripture is Proverbs 3:5-6. I know many of my readers know this scripture by heart. But for me, it has taken on a more special meaning recently. “Acknowledge Him in all your ways” is the portion I try to focus on in every situation. Asking God first and seeking His purpose is critical. My website had been doing well for a year as I continued to grow my community and develop a platform for myself. I was sitting on my sofa, and I decided to switch and check out the debates for the Republican nomination for President. I’m not really into politics like my older sister, but the attacks and arguing had me turning the channel real quick. I turned off the television and headed to bed, As my head hit the pillow, I was feeling disappointed, shocked and disappointed about what I saw on TV. So, I began to pray to ask God what is going on with this world and our country? Of course, God in His infinite wisdom answered me by prompting me to write a book on prayer to give people hope. My initial response was, write a book? Are you serious, God? It took me forever to get my website up. I have no idea how to write a book, Lord. However, there was a small part of me that was both excited and anxious about the opportunity to write a book on prayer. I had seen the power of prayer in my life and was thrilled to share my story. Let’s do this, Lord! God indeed was with me in the writing and publishing of my book on the power of prayer. 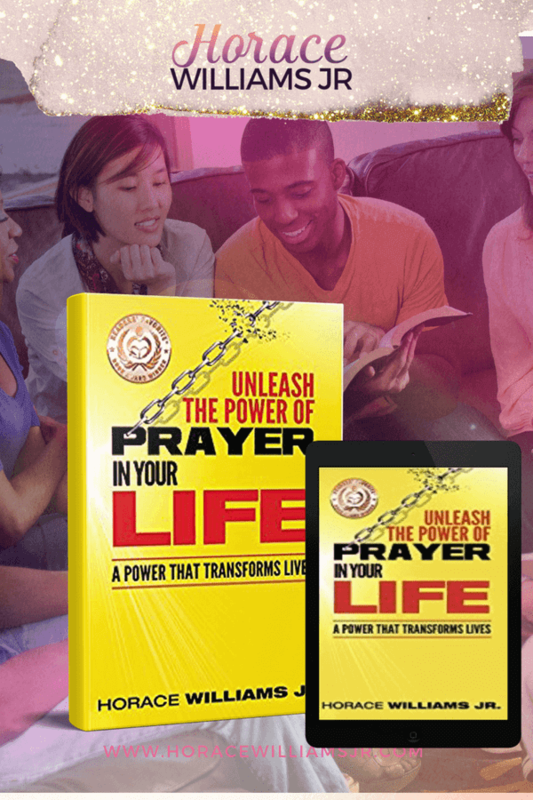 Unleash the Power of Prayer in your Life continued to receive excellent reviews and was awarded a bronze medal from Readers Favorite in the Christian non-fiction category. I wept in with gratitude to my Lord for blessing me with accolades for the book. It was an affirmation from Him in being obedient despite my fears. This December, exactly two years to the date of publishing the book, I will be attending a red carpet award ceremony at the 8th Annual 2018 Christian Literary Awards. The book is one of six other books that received a nomination for the prestigious Henri award in the Inspirational category. The awards and excellent reviews have been beyond encouraging and affirming. As a first-time author, I hope that the recognition will help in my original purpose for writing the book. I want to get it in as many hands as possible to remind Christians of the power that is available to them via prayer. I want to encourage and inspire all who read to pray with purpose. I know there are some who will visit my site-read this post while just skimming over parts of this and not read it’s entirety. I understand that’s the case in this microwave/ fast food society. I’m not sure that everyone mentioned will even read this article. I wanted to share these words of thanks because God put it on my heart. It was about a month ago, and I was halfway through writing my new book and attacked with severe doubt. It was to the point where I had considered not moving forward on this project at all. I had gotten up to take my nighttime medicine, and I was headed back to bed. I felt God leading me to my computer. He instructed me to sit down and read the book together as each chapter is currently separate. I wanted to argue with Him and get in the bed because it was 11:15 pm. So, I sat down and read each chapter and then I began to realize that this book will help and encourage all who read. I thanked God for instilling within me the desire to write about Him. I will never be able to thank Him enough for all that He has does and continues to do in my life. To borrow a thought from my new book, I am Redeemed, Restored, and God continues to Refine me into the man of God He desires. Thank Him for His grace. If I forgot to mention you, I sincerely apologize. This post would morph into a novel if I tried to thank everyone who has helped me on my journey. Maybe in my memoir, someday I can thank everyone. Nonetheless, I almost forgot to thank my beautiful mother who would take the time to proofread my posts in the beginning. Her insights and encouraging words kept me pressing forward on my writing journey. My sweet baby sister who encouraged me to write and proofreads my books before going off to the editor. A ginormous thank you to Susan Mead and Jaimie Webel who both were more than willing to promote my prayer book on their site when it published. Remember this, there is always someone you can give a word of thanks to in your life. So let your light shine and brighten someone’s day with a word of thanks. Take a moment to think about this. Does anyone come to mind? Are you willing to live each day with a heart of gratitude? Start today! Congratulations on your Henri award nomination! I have enjoyed reading more about your journey and find encouragement every time I visit. Thank you also for the encouraging comments you leave on my blog. They are very much appreciated. Lastly, I love the title of your next book! I look forward to hearing more about it! Horace, I loved reading more about your story and how God has used His family to encourage you. How thankful I am that we don’t walk this walk alone. I love hearing your heart to honor God and encourage others. Many blessings on your new book! Hello Debbie! Always a blessing to hear from you my friend. You are part of the family that encourages me my dear sister in Christ. Have a wonderful weekend and may God continue to bless you and yours in all your endeavors. Thanks for the visit and encouraging words, Debbie. I will have to remember to stop by. Yes, it is amazing when God uses your passion to serve people while glorifying Him. I am always excited to see what God has is store. Blessings to you and your new book. Horace, what a great reminder of the importance of encouragement. I know I need to work on doing more of it. My husband is a great encourager and has been a great example to me, as have many of the bloggers you have named and others. What a great community we have here on the internet. Thank you, Donna. May we live to encourage and lift up our brothers and sisters in Christ and draw people to Him. I am thankful for the community of Christian creatives that I have met on my journey to follow the leading of the Lord and glorify Him with my writing. You are a light, friend. Elaine. God has a unique plan for you and me. May we glorify Him in everything. Be well, friend and God bless. Horace, thank you for sharing your story. It’s really inspiring. I too, was welcomed into blogging with open arms by many of the ones you mentioned. It’s such a great community. Everyone is so kind and encouraging. I wish you the very best for your new book and am very excited to hear what God has done with your book about prayer! Blessings to you and on your ministry! Thank you, Leslie. Yes, the communities of Christian blogging women are inspiring. They have a heart for God and it evident by their kindness. Thank you for your words of encouragement. God continues to show Himself faithful. I wait with anticipation to see what He has planned. Thanks again for stopping by today. Have a fabulous weekend and God bless. One of the biggest surprises for me when I first started blogging (earlier this year) was the community of bloggers I have met. I pictured blogging as a solitary experience – my typing away at my laptop and publishing articles. I had no idea I would “meet” so many fascinating and inspiring people, like YOU! Thanks for the wonderful post. I could identify with it completely. NIce to meet you, Horace! Blessings! I hear you, Lauri. Writing for me still feels solitary at times. I like to be alone with my thoughts and write what God puts on my heart. The community of Christian authors, writers, and bloggers continues to amaze me. I am so thankful for the willingness to help and encourage other creatives in their endeavors. Nice to “meet” you as well. Continued success on your blogging journey. Blessings. Horace, it has been an absolute honor to get to know you and see your ministry develop and grow. Your story and testimony have truly inspired me. The way you point to Jesus and show gratitude for all that you have, even in the struggles, always blesses my heart. I am honored to have the opportunity to serve alongside you in this online world. Thank you so much for allowing me to be a part of your journey. When that new book comes out, I would love to have you back over to my space to share about it. So keep me on your schedule. Blessings to you, friend! Jaime. You are an amazing friend. I want to thank you again for all your support and encouragement. It is a blessing and an honor to have you come alongside me in my ministry. Thank you for your willingness to help. You are are definitely on my schedule when my new book launches. May God continue to bless you for your service. Be well, friend. Blessings to you and yours. Horace, I am honored to be named in this post. I am sorry for not leaving a comment sooner; I read the post the day it came through my email but I was at work and couldn’t take the time to write. You have a special ministry, Horace. Every time I visit, I leave thoroughly encouraged. You don’t know how your writing from the heart has pushed me to keep taking that “one step” to continue in pursuing the things of the Lord. I can be stubborn and that little push has been a blessing. Thank you! Thank you for following the Lord’s leading in your writing, Horace. I pray the Lord will continue to bless you and your ministry. Hey Lori, so glad you were able to stop by today. I’m glad you enjoyed this post. Your sweet spirit is something that God will continue to use to mold those young minds. I am thankful for your friendship, prayers, and encouragement. You keep taking those steps of faith and there’s no telling where God will take you. Have a wonderful weekend dear friend. May God continue to bless you and yours in all your endeavors. What a wonderful shout-out to some truly AMAZING women of God!! And of course to the Lord Himself, who makes all things possible to those who believe! I’m excited for you and the journey you are on! It sure is exhilarating at times, (and at others, discouraging), but God holds our future in His hands! LOVE your final line, “redeemed, restored and continually refined!” Amen!! Thank you, Rachel. You are an amazing woman of God yourself. It is always a blessing to hear from you. God is definitely using you for His glory. Continue on your path. You will do great things in His power. Blessings to you and yours. Kristi Woods recently posted…What is the Utility of Biblical Archaeology? Thank you, Kristi. What a pleasant surprise to have you visiting here again. Thank you for your support and encouragement. I appreciate your voting as well. Yes, I am excited to see what God has in store for my ministry. He continues to show Himself faithful every day. I will let you know how the awards banquet goes for sure. Thanks for the link to check out Joel’s games. Glad to read he made varsity. I will be saying a prayer for good health and continued success. Be well, friend and God bless you and yours in all your endeavors. Horace, I am so blessed by your ministry and your kind encouragement. How exciting to watch what the Lord is doing through your blog and now through your book. Keep sharing His message, my friend! You are a blessing! Deb, I want you to know how much I appreciate your kindness and your support of my writing. I was scared to death when I began blogging. You welcomed me with open arms and encouraged me to share. It’s my prayer that God will encourage your heart as you “count His blessings ” every day. Be well friend and God bless. How your words here touched my heart. So very timely because as I have worked to finish my book and just days away from its release, I have felt plagued by some guilt. With as much time as the book consumed and the daily upkeep of my blogging ministry (;-)) and then add in my busy family – I feel as though I have neglected in the continued encouragement of others! You didn’t know how very precisely God was using your kindness and gratitude. Your ministry, my dear friend, is powerful. I am excited to see what more God is doing in and through you! And I can’t wait to read the new book and help you share your message! You are in my prayers often!!! Bless you!!! Blessed, Horace, by your kindness and sweet words. Thank you! Praying God continues to bless you in your ministry, remind you Whose you are, and who you are in Him. Thank you, Crystal, for your inspiring words of encouragement. From the beginning, you welcomed me with open arms and allowed me to share my posts on your site. You have continued to support and encourage me for years now. Thank you for being such a blessing. I am thankful that God continues to bring alongside Christians like you to lift me up on my journey. Have a wonderful week, and may God continue to bless you and yours in all your endeavors. Horace, I always jump for joy when I see one of your new posts. I know what a challenge it is sometimes to physically write, yet you are not deterred. I’m so grateful for you, your MINISTRY (yes!) and your heart for God. I also appreciate how you’ve taken the time to say thank you to those of us who encouraged you along the way. I know there are many more and you could write a book here about it. But I also know that we’ve all been more than happy to serve and partner with you, for the glory of Christ. I’m excited about what God has been doing with your prayer book and can’t wait to celebrate with you as you launch this upcoming one. I appreciate you, dear friend. May you continue to spread the shine of God’s great love, mercy and grace. Oh, my dear Marva. Where do I begin? It is my sincere hope that I have the opportunity to meet you in person one day and give you a big old hug. Thank you for your kindness and encouragement. It has been such a blessing to me. I am excited to finish my new book as well. I am starting on the final chapter this week. Hopefully, it will publish next year. We shall see how the Lord leads. You are a beautiful vessel for Christ and I thank God for you, my friend. Have a wonderful week, and may God continue to bless you and your family.